We’d love your help. Let us know what’s wrong with this preview of Good as Gone by Amy Gentry. To ask other readers questions about Good as Gone, please sign up. i reviewed this for the L.A. review of books. i will post a link when it runs. but i don't love the nagging suspicion i have that the final title is meant to make you whisper-in-the-blank: "good as gone (girl)…. 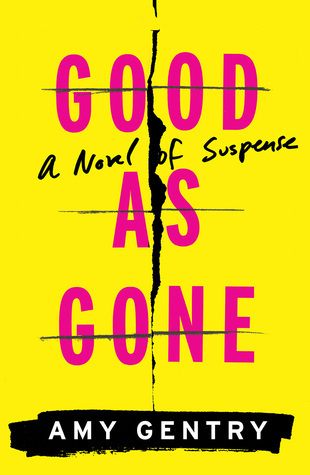 good as gone (girl)…" this mig i reviewed this for the L.A. review of books. i will post a link when it runs. but i don't love the nagging suspicion i have that the final title is meant to make you whisper-in-the-blank: "good as gone (girl)…. good as gone (girl)…" this might just be the readers' advisor in me bristling over the invocation of Gone Girl as a readalike for every single psychological suspense book published in the past four years, and may not be intentional at all, but i'm getting cynical in my old age, and i can't help but narrow my eyes suspiciously at the world around me. I'm going to start this by saying that this is one of the best books I've read in a while. Yes, I'm a suspense junkie, but I thought this one was especially well done. If ever I find myself trying to piece things together as I go and feel like I just can't quite figure it out, I know it's something that I enjoy. Good as Gone is the story of Julie, a girl who was kidnapped from her home as a child, and her family. As the events of Julie's disappearance unfold around them, their bonds as a family I'm going to start this by saying that this is one of the best books I've read in a while. Yes, I'm a suspense junkie, but I thought this one was especially well done. If ever I find myself trying to piece things together as I go and feel like I just can't quite figure it out, I know it's something that I enjoy. Good as Gone is the story of Julie, a girl who was kidnapped from her home as a child, and her family. As the events of Julie's disappearance unfold around them, their bonds as a family are questions, as well as their own personal identities and motives. What does it mean to be a family? What does it mean to even be yourself when being you isn't easy? If you like suspense novels, this one is fast paced and easy to get through. I finished it in a couple nights and found it truly hard to put down. I liked the shifting of perspectives as I felt it allowed me to get a better glimpse into what everyone was feeling. Even if given a single perspective option, I think I'd still prefer to do it as the author did. It never felt forced or awkward or confusing, only highly enjoyable. What did I think? : I really did love this book. It'll go to the top of my list in regards to books I recommend, and it'll be hard to top when choosing my next book. I thought the characters were fantastically multi-faceted, and if staying up until 2am reading is any proof of a good book then this one passes that test. Who should read it? : If you enjoy suspense novels or stories of kidnappings, then I recommend this one for you. It's not action packed necessarily, more a reverse telling of a truly life changing event. Absolutely hated this book (really ZERO stars). w Absolutely hated this book (really ZERO stars). 3.5 At the age of thirteen, Julie is believed to be kidnapped at knife point by an unknown stranger. The only witness her younger sister, Jane, hidden in a closet. Eight years later she returns with a story about being imprisoned by the leader of a drug cartel? But.... is any of this true? Anna, her mother begins to have doubts, is this really her daughter? Her husband has no doubts and welcomes back his lost daughter unreservedly. I really liked how this book was set up, kept me guessing, going 3.5 At the age of thirteen, Julie is believed to be kidnapped at knife point by an unknown stranger. The only witness her younger sister, Jane, hidden in a closet. Eight years later she returns with a story about being imprisoned by the leader of a drug cartel? But.... is any of this true? Anna, her mother begins to have doubts, is this really her daughter? Her husband has no doubts and welcomes back his lost daughter unreservedly. I really liked how this book was set up, kept me guessing, going one way and then another. Suspenseful, realistic I thought with the involvement of social media. Things we see weekly on the news. The stress on the family, the somewhat neglected younger daughter and her bitterness, all rang true. Still, I could not understand why the police were not more involved, didn't try to get to the bottom of Julie's story, that struck me as unrealistic. Though it was suspenseful, I did want to know what was going on and the author did good job maneuvering the reader through the various threads. Will more than likely read this authors next book. I had heard really good things about this book, but it ended up being a waste of time. I felt no connection to any of the characters, and I didn't feel any connection between the characters themselves. The writing used too many plot devices and ended up really choppy. The way the story was set up re: Julie from the beginning made it hard for me to be invested in her at all. Nothing in this book rang true for me and it ended up falling flat. But, when Julie suddenly re Good as Gone by Amy Gentry is a 2016 Houghton Mifflin Harcourt publication. Julie was taken from her home when she was 13 years old. Her younger sister June, was in a closet and was the only witness. June didn't move from that closet for about three hours. Eight years later Julie comes back-- 21 years old--she literally shows up on the doorstep. It's assumed Julie had been sold to a human trafficking ring, then to some drug lord. "She seems fine, all things considered", one of the detectives told Julie's parents. She's in shock and needs to see a therapist. So... therapy is part of the immediate plans. To get through the first week, Julie's mother takes her shopping.... She doesn't know what else to do with the 21-year-old woman who shows up to replace her missing 13-year-old daughter. As you might image - adjusting to the happiness of having their daughter home is actually traumatic. Normal routines just don't feel normal. Jane is in college...but is home. She is taller than her older sister. There is suppressed communications -from each of the family members. And...something is very fishy!!! Something is 'off'. Is Julie even their daughter? The mystery- storytelling will keep you turning pages. I was tucked under my covers during the dark quiet hours, 'having' to know what the hell was going on. I had an idea things were not as they seemed - however - I did not - at all - guess the theme from where this story grew. It was damn interesting. I'm still thinking about it. The author did something at the beginning of the book, though, which I can't decide if I see it as a strength or a flaw. I know I thought about it ( certainly it was a choice). She didn't go much into vivid details of how deeply the family members were emotionally affected from the inconceivable and debilitating shock during their 8 years Julie was gone. Rather... the story moved rather quickly into the 'return' of Julie. And then it's a mystery-ride....who? what? when? and why? It's GOOD! Quick read ... keeps you thinking! This is a prime example of why quality Goodreads friends are so important. The blurb states . . . . Which pretty much causes this sort of reaction by me . . . .
Lucky for me I saw Bonnie’s review instead of that crap. So what’s this one all about??? There’s the basics. If you think this sounds like a regurge of the details of Elizabeth Smart’s kidnapping you’re correct. Up to the point where . . . . Eight years later with tales of being sold to a human-trafficking ring and later to a drug lord. And that’s all you get because spoilers aren’t cool. All I can say is I’m pretty hard to please when it comes to mystery/thrillers and find the majority of them to be quite meh. That wasn’t the case with this one. I read it in one sitting and couldn’t stop turning pages. 3.5 Stars, rounded up. GOOD AS GONE by author Amy Gentry is a female psychological thriller set in Texas. It is the story of a kidnapping of a thirteen year-old girl, Julie from her bedroom in the middle of the night, while her younger sister, Jane witnessed the episode from her closet. This book is an emotional journey into a mother-daughter relationship faced by tragedy. It is a short read at 288 pages. “Julie and the strange man moved together in slow motion, as if his long arm and hairy hand were a chain binding th GOOD AS GONE by author Amy Gentry is a female psychological thriller set in Texas. It is the story of a kidnapping of a thirteen year-old girl, Julie from her bedroom in the middle of the night, while her younger sister, Jane witnessed the episode from her closet. This book is an emotional journey into a mother-daughter relationship faced by tragedy. It is a short read at 288 pages. The story is told through multiple POV’s: the mother, Anna, and daughters Jane and Julie. Her family was devastated but hoping that Julie is still alive. And then one night, the doorbell rings, when they are sitting down for dinner. Julie is at the door…she is home eight years later! But Anna, has her doubts…and has to face them. It appears that Julie was sold to a human-trafficking ring, then to a drug lord. Then Anna is contacted by a private investigator, Alex Mercado who feels there are inconsistencies in Julie’s story, she gave to the police. Now Anna must search for the truth about the woman who says she is her daughter. The reasons I didn't give this novel 5 stars is because I felt the ending was a little rushed and also I would have like the character of Jane to be more fleshed out. Overall, I enjoyed reading this book and look forward to reading more from this author. Many thanks to Amy Gentry, Houghton Mifflin Harcourt and NetGalley for an ARC in exchange for an honest review. Tom and Anna's daughter Julie is kidnapped from their home at knifepoint 8 years ago when she was 13 years old. They think she's gone forever, until one day she shows up on their doorstep. Is it really her? Could she just come back on her own after all these years? The author weaves a tale of Anna trying to chase down the truth of what happened to her daughter, where she's been and who is responsible. The story is told from different points of view as the disap Things are not always as they seem. Tom and Anna's daughter Julie is kidnapped from their home at knifepoint 8 years ago when she was 13 years old. They think she's gone forever, until one day she shows up on their doorstep. Is it really her? Could she just come back on her own after all these years? The author weaves a tale of Anna trying to chase down the truth of what happened to her daughter, where she's been and who is responsible. The story is told from different points of view as the disappearance is peeled back in layers. Just when you think you know where the author is taking you … you are taken in a completely different direction, one I did not expect. This book absolutely keeps you guessing till the end. What did I just read? This novel is all over the place, characters come and go without further explanation, the 'plot twist' is not a plot twist worth reading and the writer didn't make me care about any of the characters. I don't recommend this book at all. Ohne jede Emotion, unfassbar unglaubwürdig, gezwungen verwirrend konstruiert und schlecht geschrieben. 'Good as Gone' ist definitiv schon jetzt ein heißer Kandidat für den Titel 'schlechtestes Buch 2017'. In the years since, her family have papered over the cracks of their grief – while hoping against hope that Julie will still arrive. 13 year old Julie Whitaker was kidnapped from her home under her parent's noses without a trace yet leaving behind an eye witness of her younger sister, who watched Julie getting abducted by a man on knife point from a closet. Now 8 years has passed, and police has found no trace of Julie yet her parents, especially her mother, Anna, never lost hope that someday Julie might come back. And that her hope comes true on the day of arrival of her younger daughter from her college for the summer break, when the doorbell rings and opening the door, they are welcomes by the sight of a shabby and pale looking girl with Julie's attributes. The whole family is equally perplexed and excited upon Julie's arrival, even though the eight long years gap has perturbed the bond of relationship between Ann and her younger daughter and also her marriage with her husband has become heavy upon her. Little did Anna knew that the worst is going to unhappen and that, with the arrival of Julie, her whole world might change for the worse. The mystery concocted by the author is really brilliant as the plot only gets thicker with tension and suspense gradually through the course of the story line and the major twist or rather say the unraveling of that major twist is strikingly done, and the readers will be left anticipating till the very last page. There are so many small plot twists, that makes the story even more intriguing and engaging enough to keep the readers glued into the pages of this book. Not only that, the author has crafted this mystery with enough emotions so that the readers will be able to connect with the thriller's flow and the characters' actions. The suburban backdrop of Houston neighborhood plays slightly an important role in the story line that the author has depicted vividly and intricately that will let her readers visualize the scenes from the books unfolding right before their own eyes, not only that, the whole neighborhood will make the readers feel like they are standing right in middle of a quaint and sleepy neighborhood with pools, swing sets, malls, coffee parlors and huge billboards. The author's writing style is appealing to the very core, as it will only tempt the readers from the very first page to drown into its depth. The dialogues are laced well and strongly with emotions and cutting edge suspense and in short, they are very sharp and that will allow the readers to contemplate with the character's voice and thoughts. Told from the perspective of the main character, Anna and with occasional flash backs and narratives of either the same or some distinct abducted characters, the plot is thorough and has depth. The pacing is really fast, as I finished reading the book in just a couple of hours, thanks to the story's rush and the gripping tension, it kept me on my edges pretty much the entire length of the novel. The characters are well developed and has enough realism in their demeanor. The main character, Anna, is a sympathetic character, whose life turns upside down, when her daughter is kidnapped and so her relationship with her younger daughter and with her husband goes haywire after the kidnapping, the readers are forced to feel sorry for her. But once the arrival of the daughter, Anna becomes headstrong and begins to see the grays amongst the myriad colors of emotions upon her daughter's arrival. In a nutshell, this is an immensely interesting and mind-blowing emotional psycho thriller that depicts the bond of a mother-daughter relationship under complex light with a slight touch of slavery and forced prostitution. Verdict: A riveting psychological thriller about a mother and her once-upon-a-time kidnapped daughter. I had a hard time deciding what to rate this. After giving it 4 stars last night and thinking about how I wanted to review it I have settled on it being more accurately rated for me as a 3 star book. The first third of the book was a knock out that immediately had me rapt from the prologue. It was extremely compelling, highly emotional and even as someone who does not have kids I really felt for Anna, Tom and Jane. The book packs a wallop of a punch right out of the gate but I felt once things go I had a hard time deciding what to rate this. After giving it 4 stars last night and thinking about how I wanted to review it I have settled on it being more accurately rated for me as a 3 star book. The first third of the book was a knock out that immediately had me rapt from the prologue. It was extremely compelling, highly emotional and even as someone who does not have kids I really felt for Anna, Tom and Jane. The book packs a wallop of a punch right out of the gate but I felt once things got moving we stalled a bit in the middle. This is told from many POVs and it was a bit jarring at times to switch between known characters to unknown, seemingly unrelated people and our MCs. Within the chapters with characters we were unfamiliar with, we are introduced to even more characters that really end up not playing a role in the plot and it created a bit of a jumbled timeline that was difficult to follow. Jane watches as a kidnapper takes her sister Julie out of the house at knifepoint when she was just a small child. She hesitates before waking up her parents and Julie remains missing. Suddenly, what feels like a lifetime later, the doorbell rings and "Julie" miraculously shows up. The rest of the book moves at a fast pace between past & present and ultimately Anna (the mother) on the hunt to discover if this is really their missing Julie. The "Anna" chapters left me on the edge of my seat, Jane watches as a kidnapper takes her sister Julie out of the house at knifepoint when she was just a small child. She hesitates before waking up her parents and Julie remains missing. Suddenly, what feels like a lifetime later, the doorbell rings and "Julie" miraculously shows up. The rest of the book moves at a fast pace between past & present and ultimately Anna (the mother) on the hunt to discover if this is really their missing Julie. The "Anna" chapters left me on the edge of my seat, always ending on a mini-cliffhanger. The other chapters, different versions of who the girl that shows up actually is, showing coming to a revelation between the two storylines. It was difficult to follow along with these sections, the names, dates all blurred together and it was hard to remember who was who and in what order they happened. The ending was a bit over the top and unrealistic, but certainly a worthwhile thriller to get to the end. Anna's worst nightmare happens one night when her daughter Julie is kidnapped from her own bedroom at knifepoint. Her youngest daughter Jane is the only witness. Terrified beyond belief she waits for three hours to come out of her hiding place and alert her parents. Chances for Julie's survival are slim. Her parents struggle with maintaining hope that she is alive. Her mother's appeal - "I just want a body to bury." Eight long years later, a young woman arrives at their doorstep. Is the nightmar Anna's worst nightmare happens one night when her daughter Julie is kidnapped from her own bedroom at knifepoint. Her youngest daughter Jane is the only witness. Terrified beyond belief she waits for three hours to come out of her hiding place and alert her parents. Chances for Julie's survival are slim. Her parents struggle with maintaining hope that she is alive. Her mother's appeal - "I just want a body to bury." Eight long years later, a young woman arrives at their doorstep. Is the nightmare finally over? Anna has her doubts. But what motive could this Not-Julie imposter have? My thanks to the publishers and Net Galley for my copy. Although I enjoyed the reading of this and the plot involved it dipped in some places and frustrated me in others where I had to fully try to focus in wanting to continue at times. A young girl gets dragged out of her house at night at knife point. Her sister sees this and is hiding in a closet. I was perturbed by that as to the reaction of this sister hiding. I accepted it and moved on. Because the chapters flick back and forth it has to be very well timed so not to confuse the reader. Either I'm easily confused or it wasn't timed enough for the reader to accept the next change on route of the story. I have read many other books similar and didn't have much of a problem. This is of course my own review and my own thoughts, by no means am I saying it wasn't an enjoyable read because it was. Quick, captivating read. Emotionally disturbing. At age thirteen Julie Whitaker was taken from her bedroom in the middle of the night. Despite numerous appeals for information, nothing happens. The family, consisting of parents Anna and Tom, and Jane, the younger of the two Whitaker girls, has tried to move on with their lives. Guilt eats away at some of the family members for various reasons. And then eight years after she disappeared, a woman appears at the Whitaker home claiming to be Julie. But is she? Or is it some sort of hoax? Suspicion At age thirteen Julie Whitaker was taken from her bedroom in the middle of the night. Despite numerous appeals for information, nothing happens. The family, consisting of parents Anna and Tom, and Jane, the younger of the two Whitaker girls, has tried to move on with their lives. Guilt eats away at some of the family members for various reasons. And then eight years after she disappeared, a woman appears at the Whitaker home claiming to be Julie. But is she? Or is it some sort of hoax? Suspicions mount when certain aspects of her story do not appear to ring true. Well this was a very fast paced book, the story it's very stressing and disturbing at some points , you get confused but the ending ties some of the loose ends you get through the book. Be warned that this book deals with a very delicate issue and it does have some graphic scenes, you will be left satisfied by the ending , all in all a good book albeit a little hard to digest . I really enjoyed the start of this book and the narrator was great. However the story went way off about halfway through and I struggled with the rest of the book. The best way to describe this book: it's NOTHING like you expect from the cover. Is it particularly suspenseful? No. Is it a shocking or in-your-face story, as its bright yellow cover might suggest? Not really. But this book IS an emotional, sometimes poetic, totally fascinating glimpse into a mother-daughter relationship wracked by tragedy. Beautifully written & emotionally devastating. Full review to come on CBTB! Good as Gone follows the story of a family whose oldest daughter Julie is kidnapped from their home as a young teenager. Years go by, with no word from her or her kidnapper(s), so her family settles back into life with as much normalcy as possible. As they are sitting down for dinner one day, the doorbell rings, and sure enough, Julie has shown back up on their doorstep. After taking her to the hospital to get checked out, they welcome her back home and live life as a family. As some time passes, Julie's mother Anna starts to question whether the girl who is now living in their home is really Julie. The book alternates points of view between Anna and a number of different women from the past, that work their way progressively into real time. It's up to the reader to guess if/how they are related or if they are the same woman. I'd made my guesses and predictions, and happened to be correct! I have to say, I liked this book, but didn't love it. It wasn't quite what I was expecting, in that it doesn't have a lot of twist and turns. I'd guessed most of the ending pretty quickly, though there was one piece that was revealed that I hadn't figured out, but didn't love as it felt unrealistic, and if part of why I didn't rate the book higher. (view spoiler)[ I was not at all a fan of the religious cult aspect. (hide spoiler)] Additionally, I didn't love a lot of the characters. Anna and Tom's relationship felt really weird, and I didn't understand why the police didn't do more in the early stages of the investigation - it seemed like there was more accomplished in the private investigation Anna was working on. That felt weird. Julie's sister Jane annoyed me, too. Basically I didn't love any character in the book! Overall, the book reminded me a lot of the book The End of Everything by Megan Abbott, which I also didn't love, so maybe it's me! I see a lot of my friends loved this book, so I may just not be the right reader for this sort of story/resolution. Read the review here >> It’s been a great month. I’ve read plenty of books and I’ve loved pretty much all of them. Still, Good As Gone has been one of my favorites. This is a short book (less than 300 pages), so of course I read it all in one day. Another psychological thriller, but an unforgettable one. At first, the story seems like one you’ve read many times before. Julie was kidnapped when she was thirteen and she was never found. Eight years later, a woman claiming to be Julie comes Read the review here >> It’s been a great month. I’ve read plenty of books and I’ve loved pretty much all of them. Still, Good As Gone has been one of my favorites. This is a short book (less than 300 pages), so of course I read it all in one day. Another psychological thriller, but an unforgettable one. At first, the story seems like one you’ve read many times before. Julie was kidnapped when she was thirteen and she was never found. Eight years later, a woman claiming to be Julie comes home unexpectedly and everyone is so happy to have her back that they don’t actually see that there are holes in her story and Julie might be lying about what happened. I loved how this ended up being totally different from what I expected from the first few pages. And no, the story didn’t surprise me (I guessed what happened early on, but then again, it was what I wanted), but I didn’t mind. I loved reading how everything came to be. The author did something quite original and smart with the chapters, told by different perspectives but with a fun twist. I think this was a great decision and made me love the book even more. At first I was a bit confused and thought I didn’t understand what was going on, but then it all clicked. 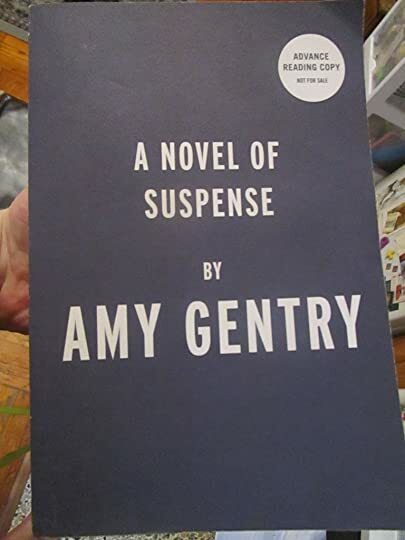 I'm pretty sure Amy Gentry doesn't know the difference between being suspenseful and straight up confusing. There was so much time spent on details that ended up not mattering at all (the Mexican drug ring? What?) and a really confusing structure (chapters alternating between the mom's POV and various other third-person POVs but those chapters went BACKWARDS IN TIME). Which all would have been fine, but then at one point I said out loud "please don't tell me this is going where I think it's goin I'm pretty sure Amy Gentry doesn't know the difference between being suspenseful and straight up confusing. There was so much time spent on details that ended up not mattering at all (the Mexican drug ring? What?) and a really confusing structure (chapters alternating between the mom's POV and various other third-person POVs but those chapters went BACKWARDS IN TIME). Which all would have been fine, but then at one point I said out loud "please don't tell me this is going where I think it's going." And you guys. It was going. And that's how it ended. So many better possible endings, and she chose that one.